Yes it’s just the first week of July and a couple more months for one of our vastly celebrated festivals and personally my favorite festival, but I think it’s the right time for me to make this write-up and spread a word about eco-friendly Ganapati idols. Ten days of beautiful Ganapti idols’ sights, from a couple of feet small to three-storey building sized idols, decorations exorbitantly expensive but a treat to the eye and the long and noisy visarjan nights are just unforgettable. But what has been forgotten is the fact that traditionally Ganapati wasn’t celebrated the way it today is. The idols would be sculpted and carved out of earthen or natural clay and decorated using little things from home, flowers and after the festival the idols would be returned back to earth by immersing in natural water bodies. There is something else that we haven’t forgotten and we aren’t completely aware of it but chose to ignore it- Usage of POP idols and other toxic chemicals for decorating these idols. The growing size of idols induced crafters to use POP because it is easier to make idols out of it and make them colorful rather than clay. The visarjan of such POP Ganesh idols converts the POP to gypsum, which breaks down very slowly in water, increases its hardness and degrades the life carrying capacity of water bodies. It forms a waterproof layer at the bottom of the water body. The rampant use of harmful paints, usage of metals like cadmium, lead is wreaking havoc in the environment and contaminating seas, lakes and ponds. 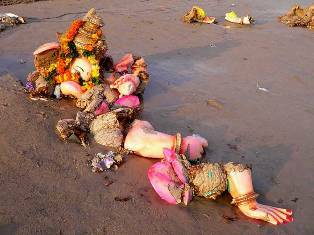 This is what happens to every single POP made Ganapati idol every single year! When will we learn? Furthermore, it can impact you too via the consumption of fresh water from lakes, seafood and fish. The impacts can be narrowed down to problems related to heart, kidneys, liver, circulatory and central nervous system. In simple words, tackling the scientific gibberish – visarjan of clay idols is returning what is earth’s whereas visarjan of POP idols is pressurizing the earth to intake what is man-made and harmful for its well being. We resort to such a harmful act at the cost of the beauty He has created. Immersion of a clay idol in a bucket. Use of a permanent Ganapti icon made of stone and brass, used every year and a symbolic immersion only. Recycling of plaster idols to repaint them and use them again the following year. Ban on the immersion of plaster idols into lakes, rivers and the sea. 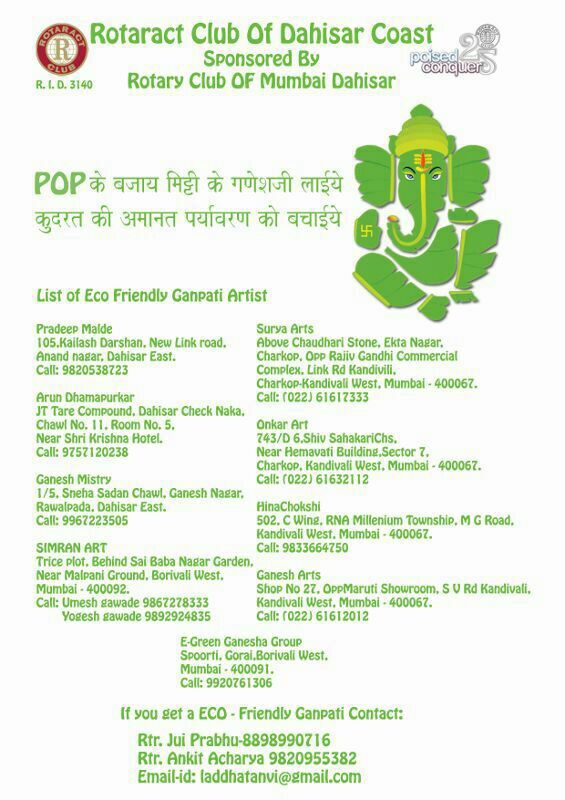 Creative use of other biodegradable materials such as papier-mâché to create Ganesh idols. Our Lord Ganesha is friendly-by-nature; why not make his idols nature-friendly too? If you stay in Kandivali, Borivali or Dahisar, here's the Rotararct Club of Dahisar Coast's initiative for you!